The first step to acquiring the aforementioned benefits is to claim your Yelp business page. Once claimed, companies have the option to upload photos, publish website links and social media profiles, and add the ever-important NAP information (name, address, and phone number). Having control of your business page also allows you to respond to reviews, both positive and negative, which we will detail later. 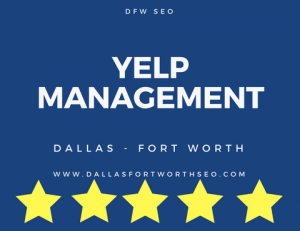 Call 800.231.4871 for Yelp management services in Dallas – Fort Worth, TX. It’s best practice to keep review responses short and concise. If possible, attempt to continue the conversation in a more private setting (i.e. phone call, direct message, etc.). Remember, responses will be public so you are not only addressing the dissatisfied customer but also everyone who happens to come across your business page. If you treat the review response as a PR opportunity, rather than damage control, you can transform a seemingly negative situation into a company asset. DFW SEO can help you get started with review management today. Because of its contribution to local SEO, the optimization of your Yelp business page is critical. NAP information is a no-brainer, and ensuring its accuracy and consistency should be second nature to business owners. To really separate your page from others, you need high quality photos, especially of your company and employees in action. Consider hiring a professional photographer to take pictures of your service jobs or business operations. Don’t forget to add links to your website and social media profiles. If you are a business owner in the Dallas – Fort Worth Metroplex, and are looking for Yelp business page optimization, you have come to the right place. Not only will we claim and optimize your business page on your behalf, but we will do the same for your Google My Business page as well. Moz’s 2017 Local Search Ranking Factors lists citation signals as one of Google’s considerations. Make sure your company is optimized for local search. Call 800.231.4871 for Yelp management services. Updated on April 5, 2018 at 3:14 pm by Dallas / Fort Worth SEO.